Tomb Raider: Chronicles is the fifth game in the Tomb Raider series and a sequel to Tomb Raider: The Last Revelation. It was released, among other platforms, for the Sega Dreamcast. 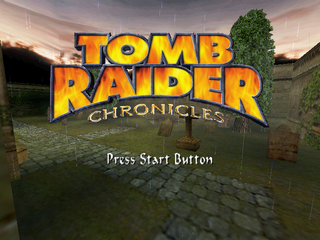 Being tied to a yearly schedule of producing Tomb Raider games, Tomb Raider: Chronicles recycles the engine seen in The Last Revelation, once again only making limited changes due to the strict development schedule. This would, however, be the last Tomb Raider game to use the engine dating back to the original Tomb Raider in 1996, as developers Core Design would employ a new engine for the PlayStation 2 sequel, Tomb Raider: The Angel of Darkness. As Lara Croft is presumed dead after the events of The Last Revelation, Chronicles features four scenarios from Lara's past, which although are considered canon, are not directly tied to an overarching main plot like in the previous games. Much of Chronicles is reportedly made up of cut content and ideas from earlier Tomb Raider games. Chronicles adds hand-to-hand combat and stealth elements to the formula, tightropes and grabbing and swinging on horizontal bars, though at its heart retains the same core gameplay as previous entries in the series. Also included is a grappling gun. Members of Core Design have gone on record about their distaste for Chronicles, having attempted to kill off Lara at the end of The Last Revelation due to creative fatigue. Main article: Tomb Raider: Chronicles/Magazine articles.